Many people find the congestion of London a turn-off when they visit but, to discover the real city, you have to go beyond its crowded city centers and into the its charming neighborhoods. “There's a beautiful, quirky, gorgeous London out there and the locals have been hiding it where some visitors won't think to look -- beyond the city's center,” writes Maureen O’Hare for CNN. 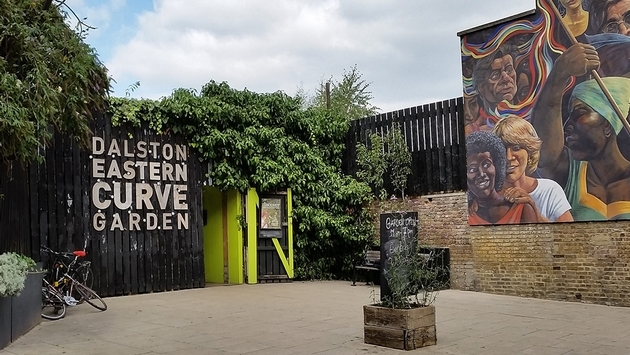 Take Dalston as one example. “Slip behind the green wooden entrance of Dalston Eastern Curve Garden and, in an instant, the grime and noise of the Kingsland Road is magicked away to be replaced by the fairy-lit pastoral glow of the very best kind of summer wedding reception,” says O’Hare. Tottenham is just 30 minutes from Oxford Circus and home to a top-notch brewery. “Thanks to its fruity and powerfully hopped American-style IPAs, and its can designs by Nick Dwyer inspired by 1950s sci-fi comic books, Beavertown Brewery has become the purveyor of London's most stylish tipples,” says O’Hare. In Walthamstow, visitors will find Gods Own Junkyard. O’Hare also points out that for those who don’t want to travel all the way to Walthamstow, they can see some of Bracey’s work at Mayfair’s Sheperd’s Market. For more tips on getting to know the outskirts of London and for a handy map, read on here.